I hope everyone had a great Thanksgiving if you celebrated! Things were very relaxed and low key around here today. Stan cooked, my mom, Miles and I played (and helped occasionally) and then we all sat down to eat until we were stuffed. Yay! I couldn't help but take a picture in our holiday pjs - how cute does Miles look?!! Truth be told, we had just got him up from his nap so he wasn't full of energy yet which is why he was calmly sitting in my arms. Towards the end of taking these pics, he was pulling at the tree, squirming to get out of my arms and then took off running into the kitchen. 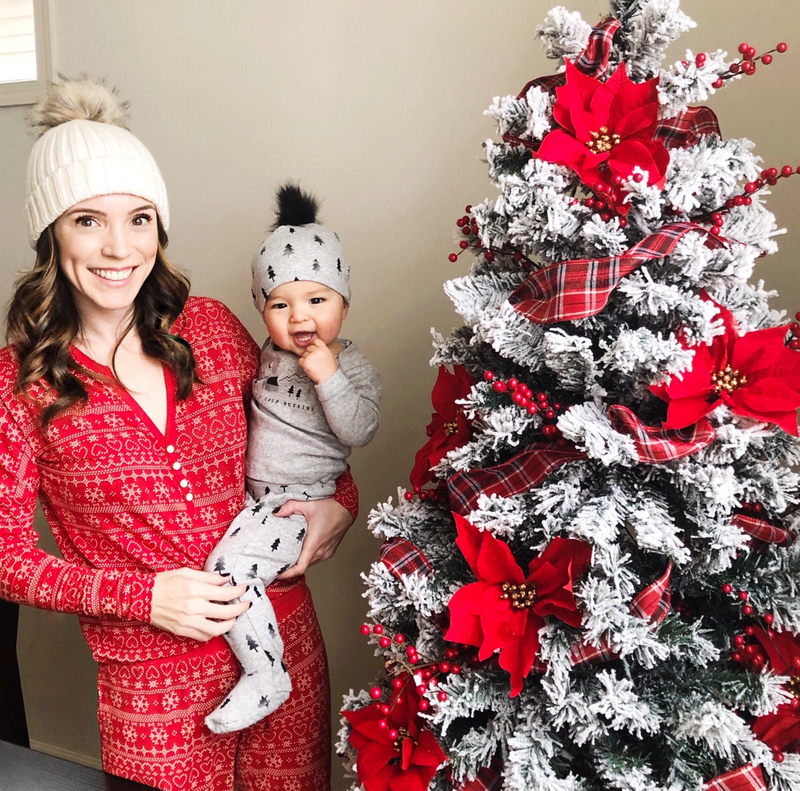 #typical If you plan to wear as much holiday themed clothing as you can, I have you covered when it comes to pjs in this post! I found some very festive options and then some subtle options that aren't as over the top. Of course I had to add a bunch of options for baby pjs because there is nothing cuter than little ones in holiday pajamas! Most of my picks are better for baby boys (I have made it my mission since having Miles to seek out the cutest stuff for boys because it can be hard to find! ), but some of the pjs would work for boys or girls. Anyone waking up early to go shopping in-store on Black Friday?!! I prefer to do it online but if the mood strikes me, I may venture in-store (for 5 minutes to get coffee and then run out! ).